I love to Worship! When I am feeling down, discouraged or overwhelmed, often my go to is Worship Music. It focuses my mind back on Jesus instead of what is going on around me. 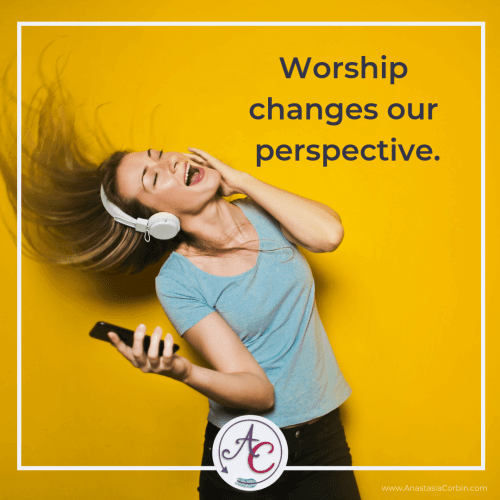 Worship changes our perspective. I heard this song for the first time at the Hearts at Home Conference earlier this month. The Dodds were our Worship Leaders. Forgiven/Chosen reminded me who I am in Christ. It also reminded me that no matter what I feel, I am forgiven and chosen by the Creator of the Universe. I recently started listening to Bethel’s new album. It is awesome! My favorite song on it so far is this one. It reminds me that God is faithful and has been so faithful all of my life. And because of that, I will sing of the goodness of God. You Never Walk Away grounds me and reminds me that Jesus will never walk away. He will deliver and defend me. I love how this song reminds me to keep standing on the promise the God is with me. There are so many amazing albums out right now. Passion’s newest album is definitely one I listen to often. I have included several of their songs on this list. Follow You Anywhere reminds me to keep trusting God no matter what. God is so faithful and easy to trust because of who He is. I can’t help but want to follow Him anywhere. The first time I heard this song, I cried. It is powerful and filled with so much truth. Often on days where I am battling the lies and insecurities, this song grounds me. It reminds me of who I am in Christ. This is another amazing song by Passion. Welcome the Healer reminds us to let God move in our lives. He is ready to bring hope and healing. Let’s welcome the Healer. Oh this song… wow, just wow! It’s a powerful reminder to surrender to God no matter what is going on. To trust Him because He is faithful and so worthy. Yes, I will reminds us that God has never failed us and never will. Are you facing a hard time right now? Maybe a situation that doesn’t make sense and it just hurts? This song speaks directly to this. We can always trust God to speak life into dust. Into Dust is powerful and will encourage you. I was in tears the first time I heard it this past summer. Another amazing song by Hillsong! This past April, it was such a privilege to hear this song live. The declaration of who I am in Christ moved me in a powerful way the first time I heard this. In case you’re wondering, you are a child of God. You are chosen, not forsaken. You are who God says you are! Holy/Worthy is another song that I heard for the first time earlier this month. Wow, just wow! This song is filled with truth. It reminds me of how I need to humbly come before our amazing God. What is your go-to when you’re feeling down, discouraged or overwhelmed? I encourage you to listen to some worship music. It will help focus your mind back on Jesus. Today, I shared 10 songs I am listening to right now. What songs are you listening to right now? Please comment below. I enjoy song recommendations. PS- Every Thursday, we take some praise breaks. Click HERE to follow me on Facebook and join in the fun. Til I found you by Phil Wickham❤️ I saw him live this year an it was such an encouraging nite!!! I will check this song out! Thanks for sharing.